Our high-temperature wire is stranded tinned copper conductor insulated with extruded ETFE Tefzel that provides outstanding thermal, physical, and electrical properties. Tefzel insulated wire is in particular outstanding for it's resistance to oil, oxidation, heat, sunlight and flame; and also it's ability to remain flexible at low temperature. They have excellent resistance to ozone, water, alcohol, gasoline, acids, alkalis, aromatic hydrocarbons and solvents. Also known as SPEC 55, or 55A wire, which is the marketing name used by TE for SAE AS22759/32 wire. Dimensionally comparable to 0.3 AVSS wire, but with M22759/16 performance. Dimensionally comparable to 0.5 AVSS wire, but with M22759/16 performance. Dimensionally comparable to 0.85 AVSS wire, but with M22759/16 performance. 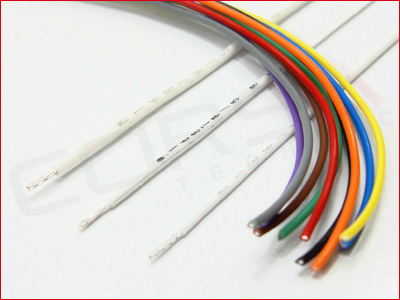 Dimensionally comparable to 1.25 AVSS wire, but with M22759/16 performance. 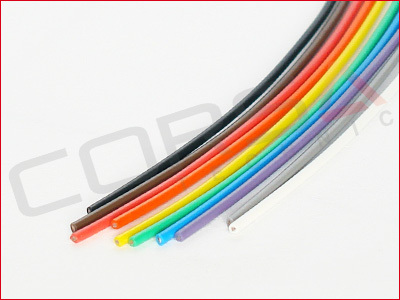 Dimensionally comparable to 2.0 AVSS wire, but with M22759/16 performance.